Putnam County Playhouse: "..A TALE AS OLD AS TIME..."
"..A TALE AS OLD AS TIME..."
BEAUTY & THE BEAST ENDED ITS RUN ON AUGUST 18. THANKS TO OUR AUDIENCES FOR THEIR CONTINUED SUPPORT!!! Click HERE to learn more about our sponsor. Director for the production is Lee Reberger, who also directed Into the Woods and appeared last season in Curtains - The Musical. Marilyn Rush is the pianist and pit conductor. The orchestra includes Michael McClaine, percussion, Drew Brattain, bass guitar; Marcia Boswell, flute and piccolo; and David Lorimer, clarinet. Many families are working together on the production. They include Ric McFadden, in the leading role of Beast, wife Shelly McFadden as Mrs. Potts, and daughter Fawn McFadden (assistant director) and grand daughters Becca George (ensemble) and Ally Taylor (spotlight operator). 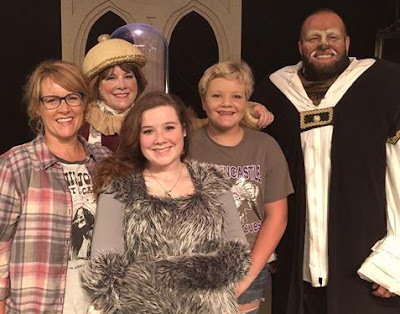 Other families include Brad Sandy (Prince/Monsieur Dark) and wife Lita Sandy (ensemble), and grand daughters Jocelyn Gardner (Chip) and Chloe Gardner, who assisted with choreography. 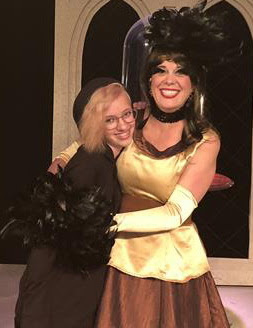 Lisa McCoy appears as Babette and her daughter Hadley McCoy is working as a backstage assistant. Matt Schneider and wife Robin Schneider are in the ensemble. Ellen McCoullough is playing Madame de la Grande Bouche. Her daughters Clarissa, Ellissa, Kaitlyn, and Hannahlore are in the ensemble. Her son Aengus is running one of the spotlights for the show. 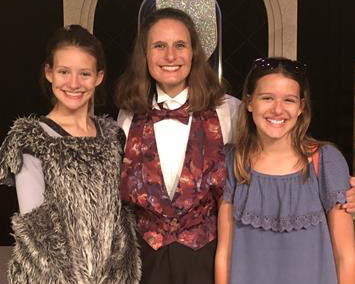 Amanda Henry and her daughter Ellie Henry - who recently appeared together in Annie are also in the ensemble, daughter Mollie is working backstage. 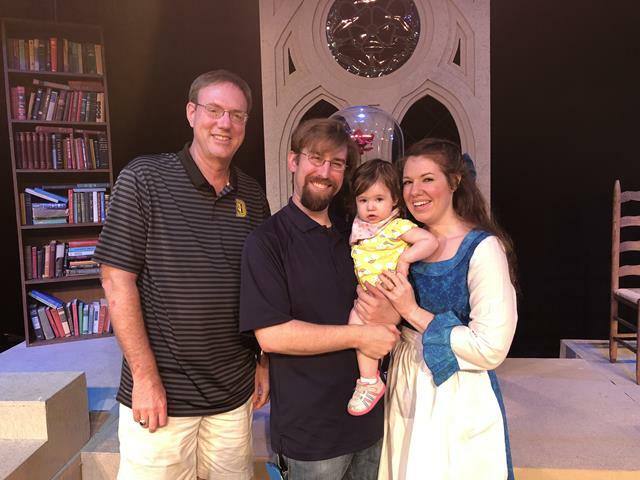 Meghan Armitage is Belle - her father Michael McClaine is the percussionist for the production. 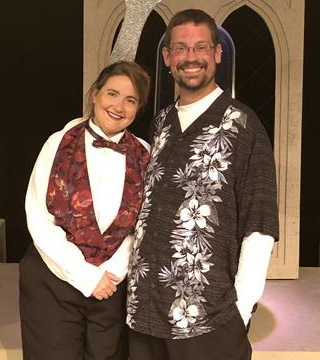 Husband Craig Armitage is sound designer for the show. Performers appearing in other leading roles are Dustin Bond (Lumiere), John Tischer (Gaston), Jay Prewitt (Maurice), Cameron Callan (LeFou), and Joshua Bain (Cogsworth). The ensemble also includes Alex Foster, Daniel Purnell, Devin Huff, Alexandra Gandy, Sarah Arnold, and Paige Kaiser. Production stage manager is Cameron Wunderlich with Anna Harris as assistant stage manager. 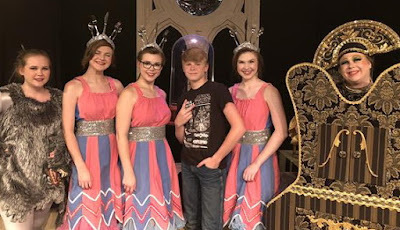 Noah Pettit is also working on the stage crew. Set design is by Linda Gjesvold. Sound designer Armitage is assisted by Darvëll Barger. Lighting designer is Dustin Bond and Grace Elmore is running the light board. 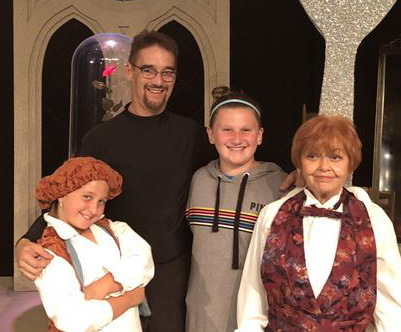 We hope your family will join our family to see Disney's Beauty and the Beast. The season of hits continues in September with Neil Simon's Barefoot in the Park. Thanks to Dustin Bond for the photographs. Thinking about Season Tickets for 2019?